Our Gaius Essential Oil Diffuser is absolutely stunning! Crafted from hand blown glass, this cool mist ultrasonic diffuser is both gorgeous and functional. It holds 230ml of water and has a safety auto shut-off feature as well as three button operations to allow for maximum flexibility in flow volume, LED light usage and timing. 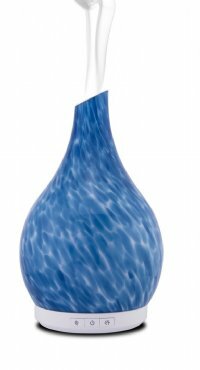 Easy to use, very quiet and visually striking, this diffuser is our new favorite! Review: Great customer service and high quality products! Review: This diffuser it’s beautiful and elegant. I saw off for right after I bought them. 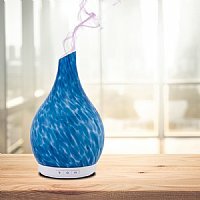 Review: I've been using essential oils for 5 or more years and have had at least 5 different diffusers. This is by the prettiest, truly a work of art. It's also efficient with a handful of diffusing options. I've been wanting a 2nd one for weeks and sad it's sold out. But it's worth the wait!! Review: This is the prettiest diffuser I've ever owned! And it works consistently which is the main thing . Everyone who sees it loves it. I came back to buy another one for my sister.